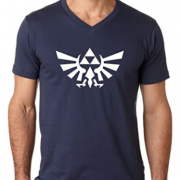 Difficulty finding the perfect T-Shirt online? We've got you covered. How do I get approved for Merch by Amazon quickly? The reason for this is that Amazon’s approach to their print on demand t-shirt service is vastly different from the likes of Redbubble, Zazzle, Teespring etc. The already established POD services accept anyone instantly, whereas Amazon works via a request and invite process. This allows Amazon to control the amount of sellers on their books and also to pull in the sellers with a higher potential to generate sales. Knowing that Amazon are actively vetting the requests to join Amazon Merch, then it makes sense to demonstrate your potential as a t-shirt designer or as an online marketer (Side note: Marketing & SEO knowledge is very beneficial on your MBA journey). 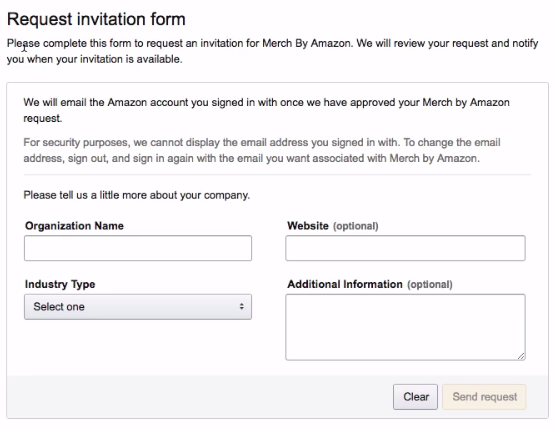 Due to the request invitation form being relatively minimal with only 4 fields, and actually only 3 that can be used to demonstrate your potential, it is vital to get the right details in to speed up your acceptance onto the Merch by Amazon programme. So during the fairly short sign up process you will see the sign up form which should look like this – nothing special to look at but it contains 3 opportunities to speed up your acceptance. Organization Name: Not really that important – you can just use your own name, a made up business name or if you actually have a business, drop the name in here. There’s not a lot you can do here to speed thing up. 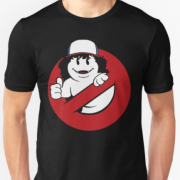 Industry Type: Select the relevant option but ideally you should be choosing “Novelty T-Shirt Business” as this tends to be what sells in the Amazon Merch sphere. Are Amazon going to quickly open a slot up to you if you’re just promoting a low level brand (musician, local business etc.)? Probably not because if you’re focusing on a single brand, your options for designs are very limited and MBA is most certainly a numbers game – the more t-shirts you create, the more that sell and the more money Amazon earn from you and lets face it, Amazon is in it for the money, and rightly so! Website: If you have a quality website that either showcases artistic ability in general, t-shirt sales, online marketing or even a non-related high traffic website (more on this in additional information) drop it in here. This will set you ahead of the crowd and either show quality design experience, ability to market well and most importantly you have an existing platform on which to market your t-shirts. If you do not already have a website consider setting one up prior to applying to Amazon Merch. Additional Information: This is your time to shine! If you added a website above, make sure to reference it here and state how you will leverage it to increase t-shirt sales. If you have associated social media accounts, again reference them and make sure you clearly explain your intent to push your designs out to a large audience. Any previous design and SEO experience should also be listed here and definitely mention your previous forays into POD with well known sites such as Redbubble. Think of this as a very, very short interview – cram as much positive information about yourself as possible and really make yourself look like the ideal “candidate”. That’s it, you’ve done everything you physically can to get your request and invitation fast tracked. There is no point in re-requesting and in fact that may even slow things down for you as there is a possibility that a second request may overwrite the first – this is just an opinion/guesswork but either way not worth the risk. 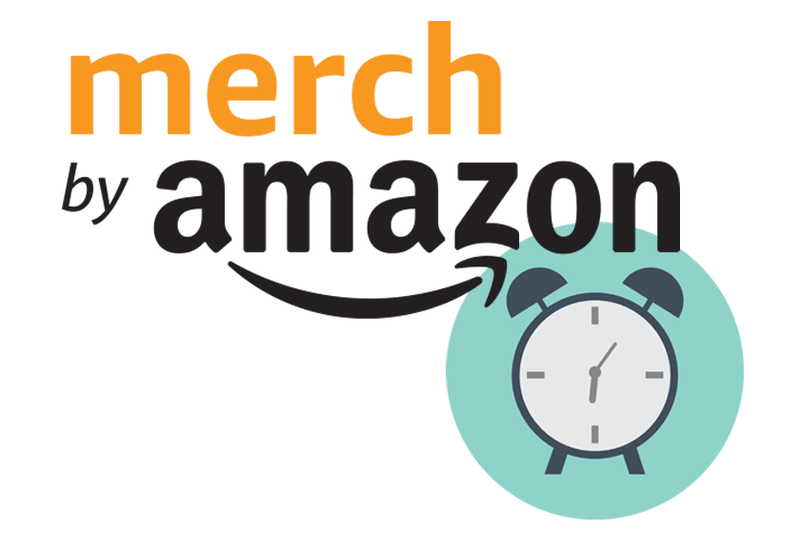 How Long Will It Take To Get Approved For Merch By Amazon? 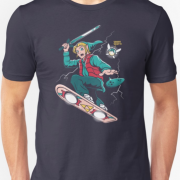 How long until I get approved for Merch By Amazon? In the beginning approval times were much faster but as of writing, the approval times can be as quick as 1 month and as long as 6 months. And much more in our Amazon Merch Series of blog posts. This entry was posted in Merch by Amazon Series, T-Shirt Design Articles and tagged Amazon Merch. 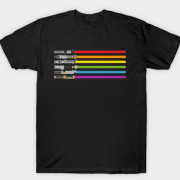 Our T-Shirt articles come in two flavors, one for T-Shirt Designers with helpful creative and marketing tips and one for T-Shirt Buyers with hand picked T-Shirt Collections. 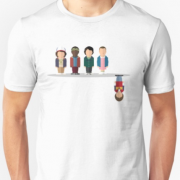 With more and more T-Shirt sites popping up like Redbubble, Teespring and even the shopping giant Amazon it can be very difficult to find that perfect, funny, unique ororiginal tee that you're looking for. That's where we come in, we do all of the hard work and scour the many, many T-Shirt design sites out there, social media accounts, shopping search results and trending designs and aggregate the very best results for you all in one location. .
Be the first to know about amazing new designs, discount codes and exciting new T-Shirt collections. Sign up for our weekly newsletter today.